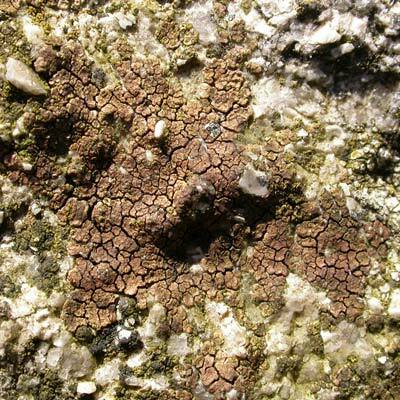 A not uncommon lichen of nutrient-rich, siliceous rock ledges, brick wall tops, acid rock memorials and the tops of standing stones A. fuscata has the appearance of cracked mud when dry so is easily overlooked. 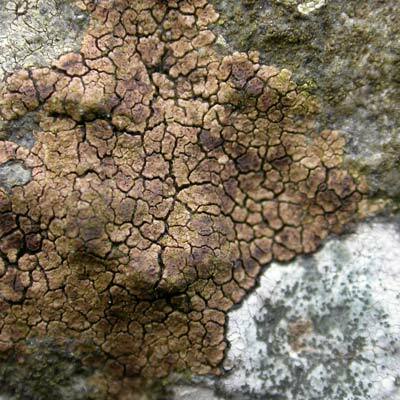 In colour it ranges from pale yellow-brown to warmer reddish-brown tones, the whole thallus appearing shattered like a mirror into angular areoles. The reddish-brown discs sunken into the areoles are more obvious when wet. Look for it on acid rocks where birds are frequent visitors. A dab of bleach will turn the thallus red. Simms, M. J., (2016). Acarospora fuscata (Schrad.) Th.Fr.. [In] LichenIreland.